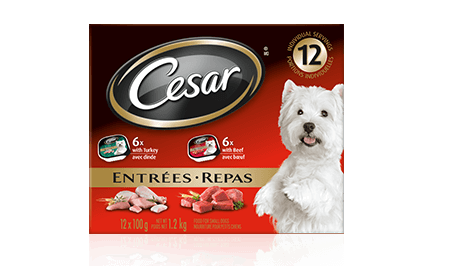 CESAR® ENTRÉES: 6 WITH BEEF + 6 WITH TURKEY 12x100g is rated 4.4 out of 5 by 61. Rated 3 out of 5 by STACYBNB_364710402 from I have two dogs and my dogs loved it! However, after they ate the 3rd sample (one sample each per day) I've noticed their ears starting to turn red and get irritated. I stopped giving them the samples and their ears went back to normal (after a couple days). I tried another sample with them and their ears started to get red again. I gave the rest of the samples to my friend and her dog loved them with no issues. My dogs must be sensitive to an ingredient in the product, otherwise they would've ate the rest. Rated 3 out of 5 by HEATHERMON_364694790 from The product is great, my dog couldn't wait to eat it every time i gave him one and hes a very picky eater! He licked the container clean every time, and didn't affect his sometimes sensitive stomach. I would like to feed this to him everyday, but what stops me is the cost. It would be very expensive for me to switch to giving him this solely instead of kibble and a portion of his wet food. If you came out with like a topper or something to add to his kibble, I absolutely would be a buyer. Rated 5 out of 5 by JOCAB_364702884 from Both of my dogs loved this food!! The container is very easy to open (important issue for me) and the portion size of the container is great for a meal. Both of my dogs were climbing all over me when I opened the containers and they barely let me put their dishes on the ground before they started eating. My dogs did not have any digestive issues after eating Caesar (they have had issues with other brands of wet dog food). I will definitely be buying this food for my two dogs in the future! Rated 5 out of 5 by SHERRYCON_364692162 from We keep dry dog food down all day for our dog. At dinner time she gets wet food. Even though there is still a bowl of dry food available to her, she does not consider herself as being fed until we give her the wet food. We used to buy canned wet food for her until we tried Cesar. We love that she gets 'fresh' wet food every day. We love that the portion is perfect for her, and how easy it is to feed it to her. When we gave canned food, the portions were never the same and after the first day, it just isn't the same quality. With Cesar, it is consistent. There is an excellent variety of flavours. Our dog gets excited as soon as she sees it coming out of the cupboard. An added bonus - when she has to go to the grandparents for a few days, it's very easy to transport to them and for them to know exactly how much to feed her. Rated 5 out of 5 by LINDALON_364702271 from The minute I opened the package and the dogs could smell it they got very excited. I am wary of soft food as it has upset my dogs stomachs in the passed. However with Cesar my dogs did not react to it at all. They have eaten them and everything has remained the same. No upset stomach and regular bowels. It's a very good product and I plan to purchase more of it. Thanks for letting us try it!! Rated 4 out of 5 by AMANDADON_364706739 from Although I don't like the smell of wetdog food, this food was not as bad as I expected. I think the consistency is what my dog enjoyed the most, it wasn't that gross mush stuff. The product seemed high quality and when I purchased it even the cashier was surprised that I was getting it for free. Although it is a bit more pricey then other brands, you can tell it's for the quality. Rated 4 out of 5 by HEATHERRON_364716235 from My dog loved it, he gobbled up his meals. But due to his size he would need to eat quite a few of the containers, so while it is a nice treat it's not very economical for everyday meals. I do think it's a great product, especially for smaller dogs. Rated 5 out of 5 by TAMMYPON_364693545 from The only thing I didn't like about the product is the packaging. It would be much better if it came with a lid or an option to purchase a reuseable lid for those of us who do not use the whole thing at once. CESAR® Entrées With Beef Food For Small Dogs is formulated to meet the nutritional levels established by the AAFCO Dog Food Nutrient Profiles for maintenance. CESAR® Entrées With Turkey Food For Small Dogs is formulated to meet the nutritional levels established by the AAFCO Dog Food Nutrient Profiles for maintenance. Beef:MEAT BY-PRODUCTS, LIVER, BEEF, CHICKEN, CHICKEN BY-PRODUCTS, MINERALS AND VITAMINS, GUMS, COLOUR, DRIED YAM, NATURAL FLAVOURS, SODIUM NITRITE (FOR COLOUR RETENTION), WATER SUFFICIENT FOR PROCESSING.Turkey:MEAT BY-PRODUCTS, LIVER, TURKEY, CHICKEN, CHICKEN BY-PRODUCTS, MINERALS AND VITAMINS, GUMS, COLOURS, DRIED YAM, NATURAL FLAVOURS, SODIUM NITRITE (FOR COLOUR RETENTION), WATER SUFFICIENT FOR PROCESSING.